They won gold in Vancouver, silver in Sochi, and on Sunday they won the hearts of Canada. 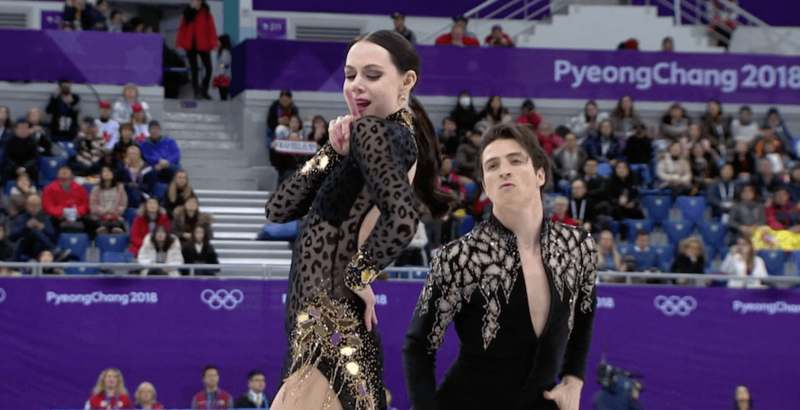 Canada’s favourite should-be couple, Tessa Virtue and Scott Moir heated up the ice again in PyeongChang. The Canadian champions posted an all-time best short dance score of 83.67, leaving them in first place after the short dance. “We knew wanted to peak right now and we had a vision for this program, and we’re thrilled with the way we executed today,” said Virtue in a post-skate interview with CBC. Virtue and Moir broke their own record of 82.68, set at the 2017 Skate Canada International competition. They now own the top-three short dance scores of all-time. And believe it or not, they think they can be even better. “We can always pick it apart and find room for improvement,” Virtue added. In second place are their chief rivals, Gabriella Papadakis and Guillaume Cizeron of France, who posted a score of 81.93 despite a wardrobe malfunction. Two other Canadian ice dancing teams are in the top-10, with Kaitlyn Weaver and Andrew Poje ranked eighth and the duo of Piper Gilles and Paul Poirier in ninth spot. Virtue and Moir have already won a gold medal at PyeongChang 2018, standing atop the podium last week in the team event. But winning gold in the individual event is what will cement their legacy. Canada’s flag bearers need another strong performance in the free skate on Monday.